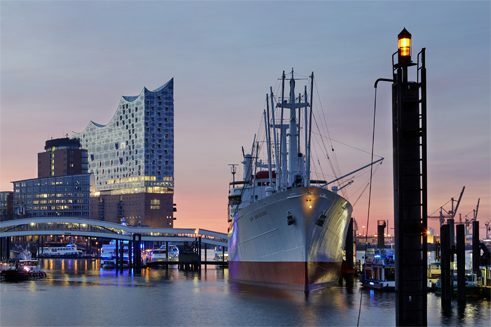 It is already considered to be a once-in-a-century construction and a landmark of the port of Hamburg – the Elbe Philharmonic Hall. Architecturally, neither cost nor expense was spared. Was it worth it? This is a photographic tour round a building of unrivalled dimensions. 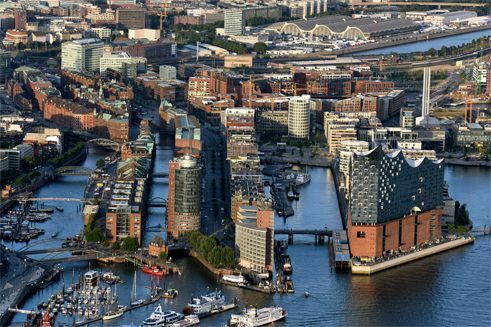 Hamburg’s HafenCity has evolved from being the oldest section of the port of Hamburg into a new district with 7,000 apartments and 45,000 jobs. With an area of ​​157 hectares, the Hafencity is the largest inner city development area in Europe. 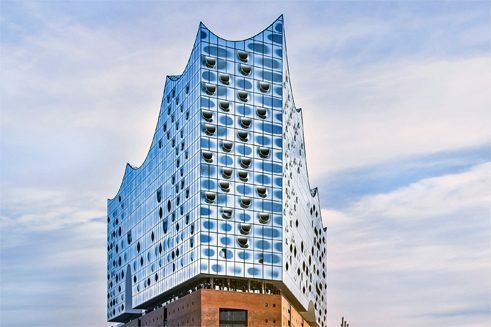 On its western edge the Elbe Philharmonic Hall has now been opened and towers up as a brightly shining beacon; a building of superlative dimensions that prides itself in being home to one of the world's best concert halls. The construction costs, however, also took on superlative dimensions. They were officially announced to be around 789 million euros, including the privately financed luxury apartments, but in fact they probably exceeded one billion. When project developer, Alexander Gérard, first presented the project in 2001, the cost of the Philharmonic Hall was estimated at around 40 million and was to be financed by the apartments and the luxury hotel, as well as by private foundations and sponsoring associations. The political squabbles, overruns in costs and deadlines, as well as all kinds of confusion about the planning and construction triggered a public debate that lasted well over a decade. After the splendid opening in January 2017, however, the people of Hamburg made peace with the project. Anger and frustration have given way to pride and joy. The project also embraces to a certain extent the preservation of a historical monument. Kaispeicher A, a former warehouse for cocoa and coffee, built between 1963 and 1966, seems to carry the Philharmonic Hall’s glass top section on its roof. However, only the non-load-bearing exterior shell of the original building has survived. The building was restructured with an interior foundation mounted on bored piles. Kaiserspeicher A 1963 at Hamburg harbour | Photo (detail): © Zoch Furnishing the building with an attractive, freely accessible panoramic “Plaza” terrace with all the usual catering outlets proved to be a clever move. Locals and tourists flock in droves to take a look at the Elbe Philharmonic Hall and are impressed. The events taking place there are sold out months ahead of time. 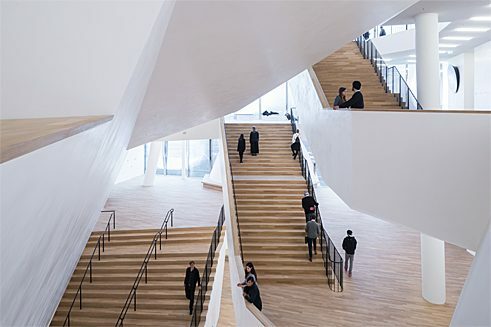 Its prominent location quayside on the port and the iconic architecture of the Swiss architects, Herzog und de Meuron, have already made the Elbe Philharmonic Hall a landmark and a once-in-a-century building. As a tourist attraction, it is in the same league as the Centre Pompidou in Paris, the Sydney Opera House and the Guggenheim Museum in Bilbao. It still remains to be seen, however, whether the efforts of the city of Hamburg have actually paid off. Whatever the case may be, when it comes to its construction and amenities no expense was spared. Kaiserhöft is the name of the area at the tip of the Kaiserkai, which was one of the first districts of the new HafenCity to house residential and commercial buildings. The master plan from the year 2000 envisaged the area serving a special public purpose. Later, the city decided to build a further office complex there, as was the case opposite on the Sandtorkai. But now, in its prominent position on the land spit between Norderelbe and the Sandtorhafen museum harbour, the Elbe Philharmonic Hall is majestically visible. The quayside walls and the decommissioned cranes have remained intact, contributing to the maritime character of the focal point of Hamburg's high culture, enthroned on its dockside warehouse pedestal. The symbolic, emblematic quality of Herzog and de Meuron’s design had already taken form in the very first sketches in 2001. 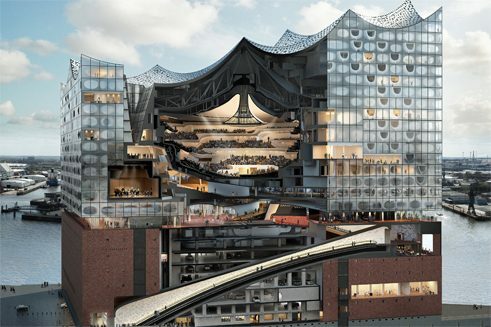 It was this design that contributed significantly to the fact that the Elbe Philharmonic Hall project, which was initially launched as a private initiative, was able to win over the local population and the Senate of Hamburg. Inspired by its characteristic location, the new building was not to become a mere contemporary architectural artefact, but a port building that both lives from and contributes to a real maritime aura. Like the rigging of a four-mast tall ship, the building towers 102 metres into the air. With its wavy and sail-like roof, it fits perfectly into the silhouette of the port panorama. For the extravagant façade special windows made of four glass panes were developed. With a width of five metres wide and a height of 3.33 metres, the largest façade elements weigh 1.5 tonnes. Individually printed with a special grid of dots, they provide controlled light and heat protection as room partitions for apartments, hotel rooms, foyers or service rooms, depending on their designated task. 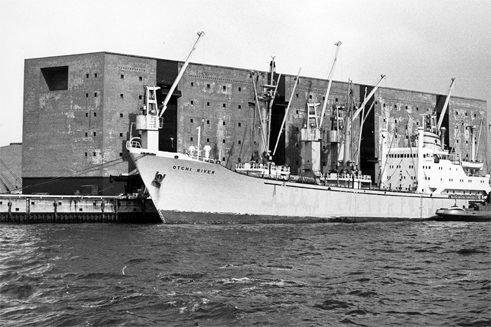 In addition, because of the buildings location on the port, they had to have certain radar reflective properties. About a quarter of the 2,200 discs are individually curved, which meant they had to be worked individually, causing the cost per disc to rise to 70,000 euros. This cross-section image shows the inside of the concert hall. In the lower warehouse segment there is a seven-storey car park with 433 parking spaces, the Kaistudio with seating for 150, along with administrative and auxiliary rooms. A long, curved tunnel with an escalator leads visitors up to the plaza between the old warehouse segment and the new building. The plaza is the interface between the historical warehouse building and the new glass building on top. A luxury hotel with 244 rooms on the east side on the left and 43 premium apartments on the west side of the building form a kind of architectural shell that shields the concert halls from the noise of the port. The double-track escalator is the only one of its kind in the world and an attraction in itself. It is 82 metres long and in two and a half minutes transports visitors over an ever-changing convex slope up to the sixth floor. The white plastered walls of the seemingly tapering tunnel – the “Tube” – are decorated with glass sequins. When the visitors finally arrive at the top, they are overwhelmed by a panoramic window that has a great view of the river Elbe to the west. The 4,000-square-metre Plaza is a public space open to all, particularly popular with both tourists and locals. From a height of 37 metres, you can enjoy an impressive all-round panorama. Whether you walk round it outside when the sun is shining or you shelter from the wind behind the glass, the port panorama, the Speicherstadt (warehouse district) and the distant city centre of Hamburg will not fail to impress you. 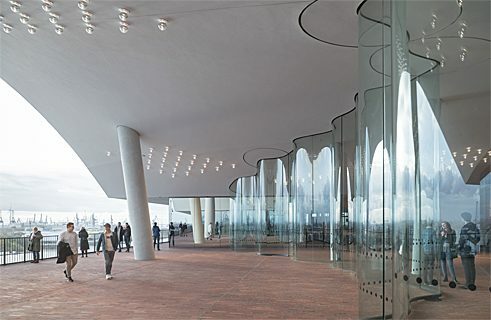 Six-metre-tall, undulating glass walls shield visitors from the wind. When the weather is favourable, some of the S-shaped glass elements can be rotated and thus opened. In the public area there is also a café, the hotel lobby and a souvenir shop. The access areas leading from the Plaza to the foyers of the two halls into are an architectural experience. While the staircases to the ninth floor start off in a winding form, their further progression up to the 15th floor, i.e. to the foyers, to the foyer bar and to the upper balconies, takes on a more slanting and conical appeal and is reminiscent of Hans Scharoun's foyer of the Philharmonic Hall in Berlin. This was of course no accident, as the actual concert hall section of the building is, both in its structure and architectural form, a close relative of the famous model from the Berlin of the 1960s. Today there are two fundamentally different ways of designing a concert hall: via the “shoe box principle” or the “vineyard principle”. 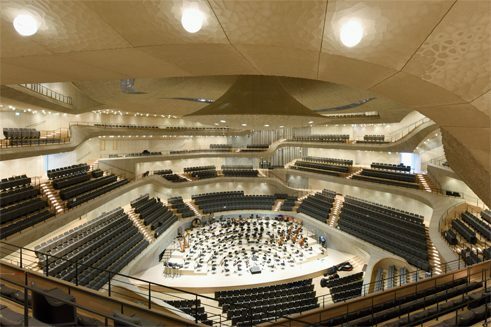 The large concert hall at the heart of the Elbe Philharmonic Hall was conceived according to the “vineyard principle”, which Hans Scharoun invented for the Berlin Philharmonic hall. The orchestra sits in a kind of arena that is slightly off-centre of the middle of the hall, surrounded by up to five levels of seating terraces. These seating terraces rise up steeply, just as they do in a modern football stadium, so that none of the 2,100 concertgoers are seated more than 30 metres away from the conductor. The entire hall construction is suspended on 362 steel springs and is thus acoustically decoupled from the rest of the building. 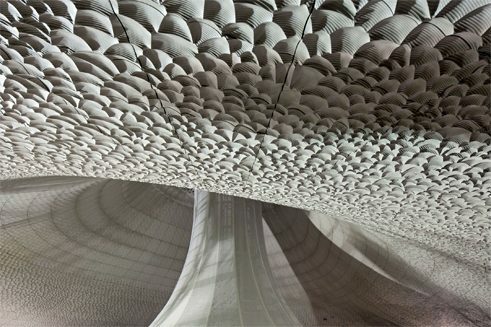 The architects call the interior walls of the concert hall “white skin”, the sound properties of which were developed by the acoustician, Yasuhisa Toyota. 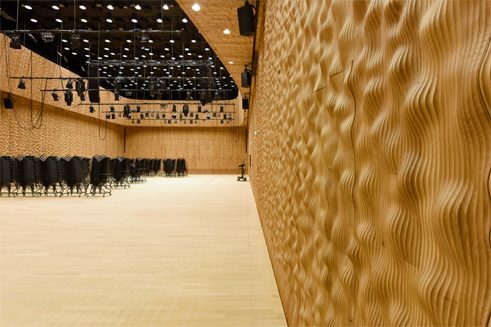 The walls are made up of 10,000 gypsum fibreboards, each of which has been individually endowed by milling machines with an uneven surface, consisting of recesses, grooves and cones that provide the best reflection and dispersion of sound. The exact geometries were calculated by computer and determined experimentally in a 1: 10 scale model of the hall. The acoustics of the hall have been described by concertgoers as extremely clear and transparent, others, however, have also voiced criticism. “The hall is so unforgiving,” said the musicians. The smaller Chamber Music Hall on the 10th floor with up to 550 seats was conceived according to the conventional “shoe box principle”. It is a rectangular room, along the side of which the orchestra is narrowly positioned. The podium can be adapted to various types of events with flexible platform technology. In this hall too, the walls were designed primarily with acoustic requirements in mind. The corrugated surfaces of the oak wood panels were created by computer-controlled milling machines, fully in line with the calculations of the acousticians, and conjure up a rippled water surface. The character of the room is more intimate, more welcoming and has the look and feel of a warmly shimmering string instrument.